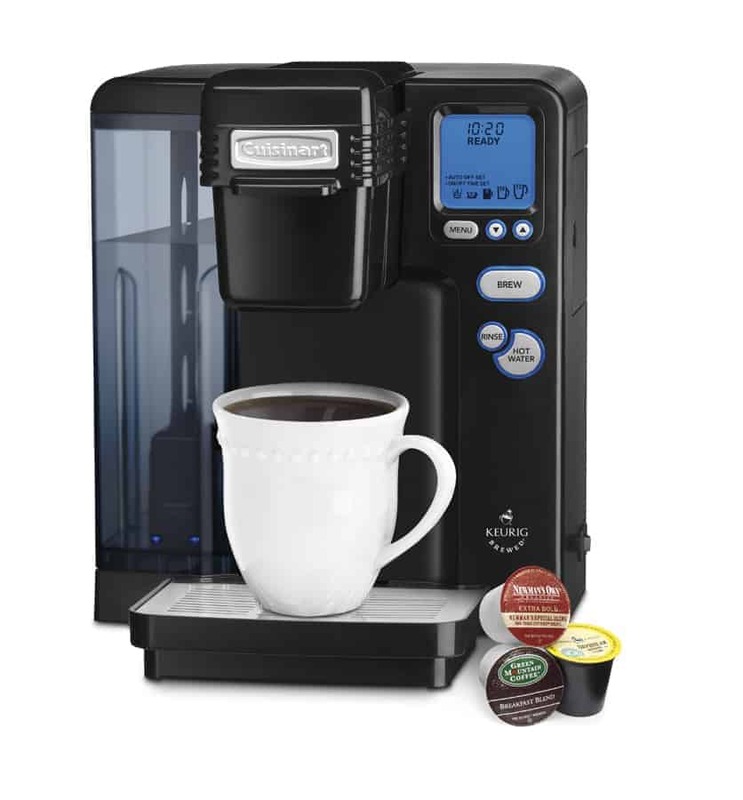 Welcome to the Cuisinart Single Serve Keurig Brewing System Giveaway! I use my Keurig Brewing System everyday. I love making just a single cup rather than wasting a whole pot of coffee. Oh and the flavours! Another huge perk of having a Keurig. The Cuisinart Single Serve Brewing System is powered by Keurig and perfect for personal use or entertaining. Using the Keurig K-Cup, this single-serve home-brewing system offers consumers fresh gourmet coffee, tea, hot cocoa and more in under one minute. In addition to the over 200 varieties of K-Cups, the Cuisinart Brewing System includes the My K-Cup Reusable Coffee Filter that can be filled with your favorite ground coffee. Perfect for both personal use and entertaining, this single-serve home-brewing system offers consumers fresh gourmet coffee, tea, hot cocoa and more in under one minute. Using Keurig K-Cups®—featuring over two hundred varieties of pre-measured, premium brand coffee and tea—this brewer’s innovative one-touch technology makes it easier than ever for consumers to enjoy a wide array of hot beverages. Read Kate n’ Kaboodle’s Review of the Cuisinart Single Serve Brewing System here. The Cuisinart Single Serve Brewing System, as well as a wide selection of Camera, Computer, Television and Home & Garden products, is available at BuyDig for $199. Giveaway ends June 30th at 11:59pm. Open to U.S., 18+. Enter using the Rafflecopter form below. I love the Canon Rebel camera! I like the Canon EOS Rebel T3 Digital SLR 2 Lens Bundle Deal w/ bonus accessories. I so badly want a Canon EOS rebel T3!! Nikon D3100 14MP Digital SLR 2 Lens Kit with free accessories! our grill died and we need a new so i’d LOVE to have Weber 7120001 Summit S-420 LP Gas Grill – Stainless Steel lol lol only in my dreams!!!! I would love the Cuisinart HM-90S – Power Advantage Plus 9-Speed Hand Mixer! The Nikon d800 for sure! I like the canon rebel camera! Thanks for the contest. I like Nikon D3100 14MP Digital SLR 2 Lens Kit with free accessories! Nikon D800E 36.3 MP CMOS FX-Format Digital SLR Camera would be fantastic! I have always wanted this coffee maker, used it at a friends house and LOVED it! My favorite buydig.com item is the red Samsonite luggage set! I love the UN75ES9000 75 Inch 240Hz 1080p 3D WiFi LED HDTV! I Love the Nikon D800E! The G Series GT70 2OD-039US 17.3″ Full HD Notebook PC looks very nice!